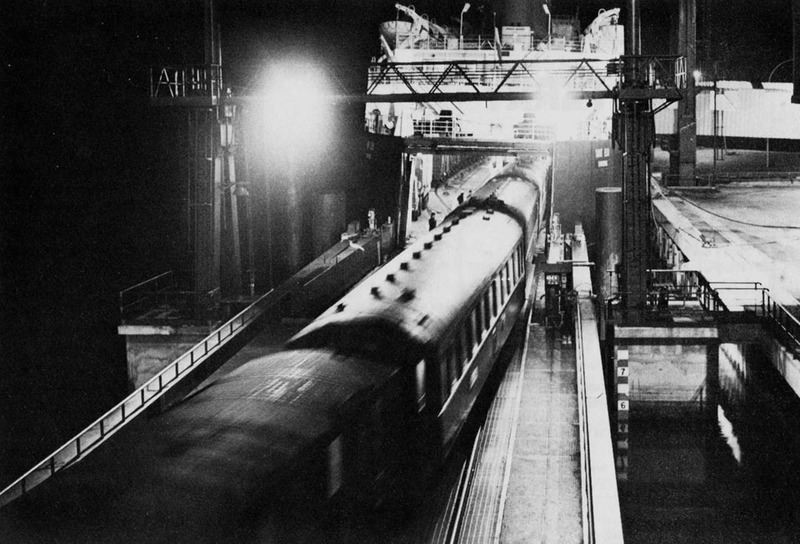 Introduced on the night of the 14th-15th October 1936, the Night Ferry was an international sleeper train operating between London Victoria and Paris Gare du Nord. In later years Brussels was also served. The service was operated by the Compagnie Internationale des Wagons-Lits, SNCF (French National Railways) and the Southern Railway. Following the nationalisation of the British railways on the 1st January 1948, the Southern Region of British Railways took over from the Southern Railway. 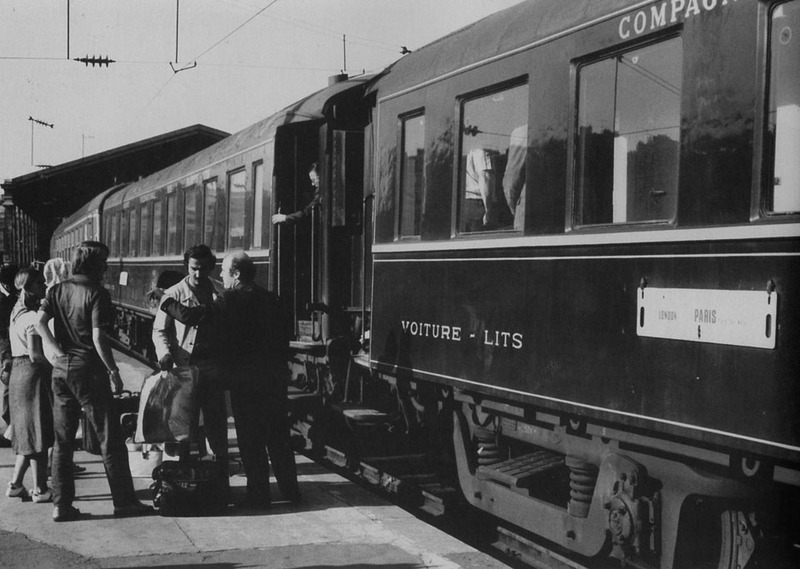 The service featured newly constructed sleeping coaches from the Compagnie Internationale des Wagons-Lits built to an adapted design to fit the British loading gauge, of the so-called type F ( F for Ferry). The Night Ferry normally departed from and arrived at platform 2 at London Victoria station with Customs checks being carried out at the station. Until the commencement of Eurostar services on the 14th November 1994, the Night Ferry had the distinction of being the only through passenger train between Great Britain and Continental Europe. 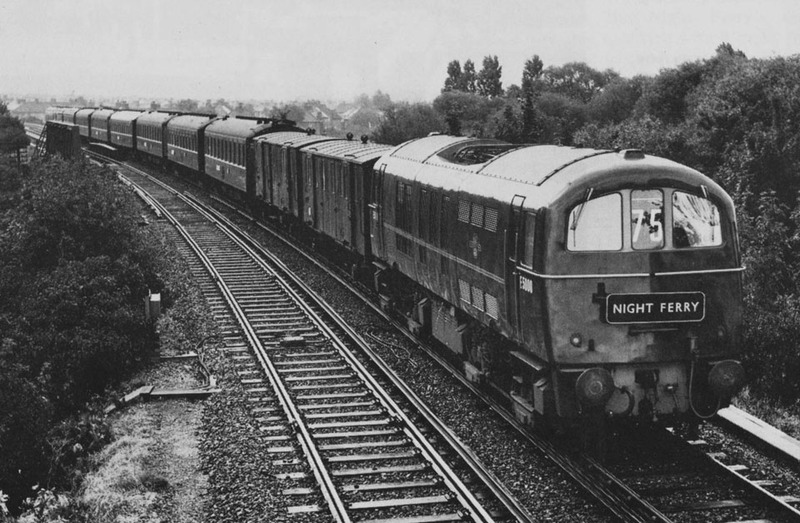 An attempted resurrection of British–Continental sleeper services under the Nightstar brand was planned after the opening of the Channel Tunnel in 1994 but this was abandoned due to spiralling costs and increased competition from cheap airlines. Harwich – Zeebrugge train ferry inaugurated by Great Eastern Train Ferries. Société Anonyme de Navigation Alsace-Lorraine – Angleterre (ALA) registered in Paris; renamed Angleterre-Lorraine-Alsace on February 23rd 1927. Owned by the London Midland and Scottish Railway (LMS) and the Nord Railway associate SAGA. Start of ALA/LMS steamer service from Dunkerque to Tilbury using ex-LMS Irish Sea steamers LORRAIN (ex Rathmore), FLAMAND (ex Londonderry) and ALSACIEN (ex Duke of Argyle). ALA buys the DUKE OF CUMBERLAND (renamed PICARD), replacing LORRAIN. The British Parliament turned down the proposal for a Channel Tunnel by 179 votes to 172 on a free vote. 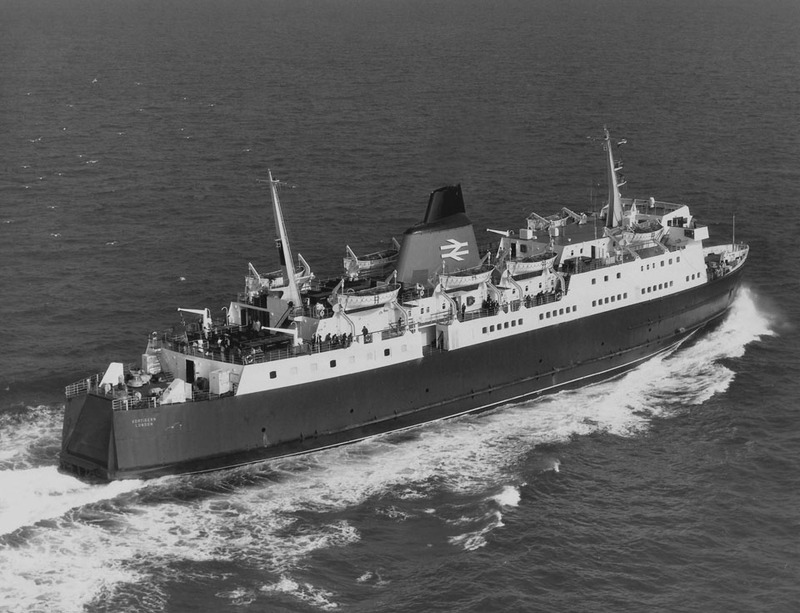 Sir Herbert Walker, General Manager of Southern Railway, started negotiations for a Dover-Dunkerque train ferry in November. The Southern Railway buys out the London, Midland and Scottish (LMS) shareholding in the ALA steamship company. 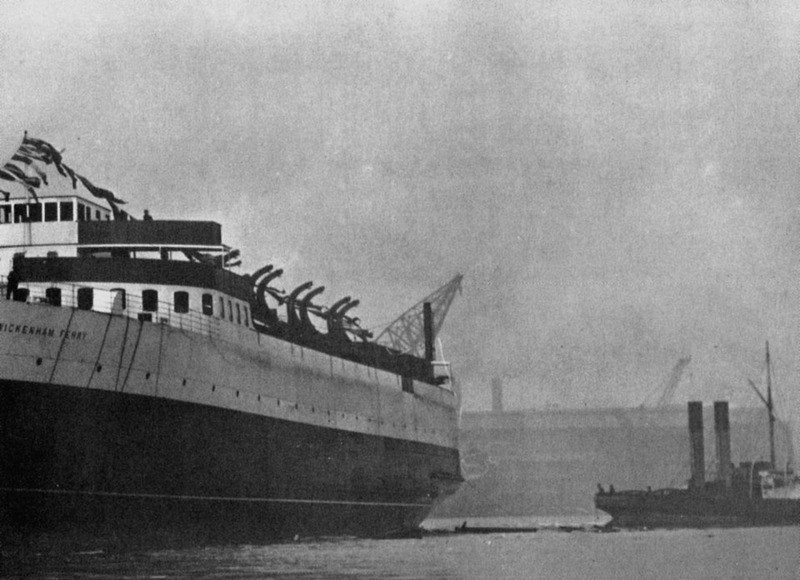 ALA starts running Dunkerque-Folkestone instead of Dunkerque-Tilbury. 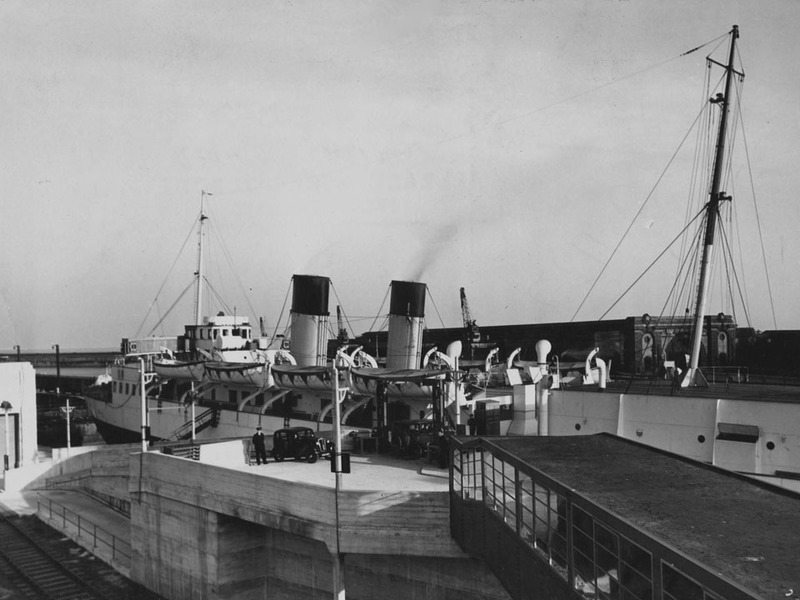 The LNER buys up Great Eastern Train Ferries and starts a (tidal) Harwich-Calais freight train ferry, using Calais’ wartime linkspan. 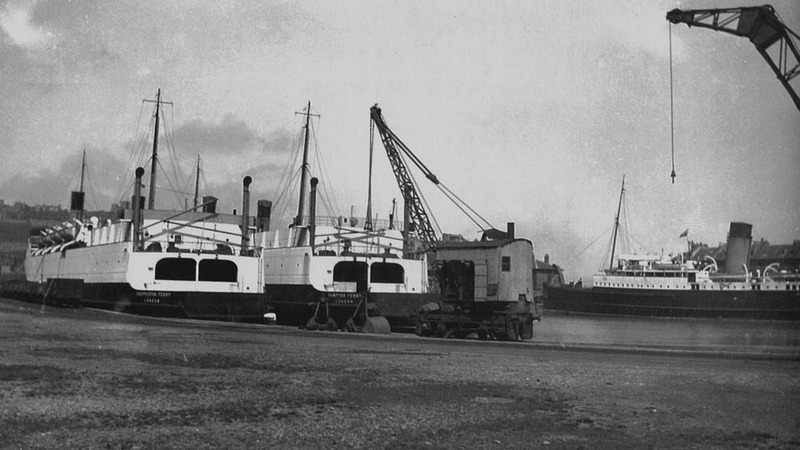 The Southern Railway ordered three identical stern-loading steel hulled twin screw turbine steamer train ferries for their intended new Dover-Dunkirk ferry service. Built by Swan, Hunter and Wigham Richardson Ltd., Walker-on-Tyne. The Southern Railway buys most of SAGA shares in ALA and gains control. 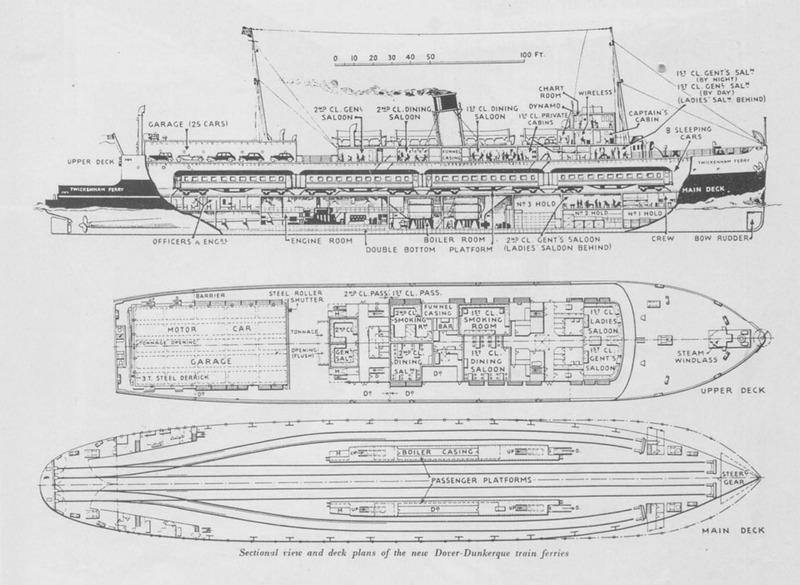 A tender of £231,000 for the construction of the special Train Ferry Dock at Dover was awarded in early August to John Mowlem & Co., and Edmund Nuttall & Co.,both of Westminster which specified the construction of a concrete dock 415 feet long and 72 feet wide, and having a depth of water varying from a minimum of 17 feet to a maximum of 36 feet. 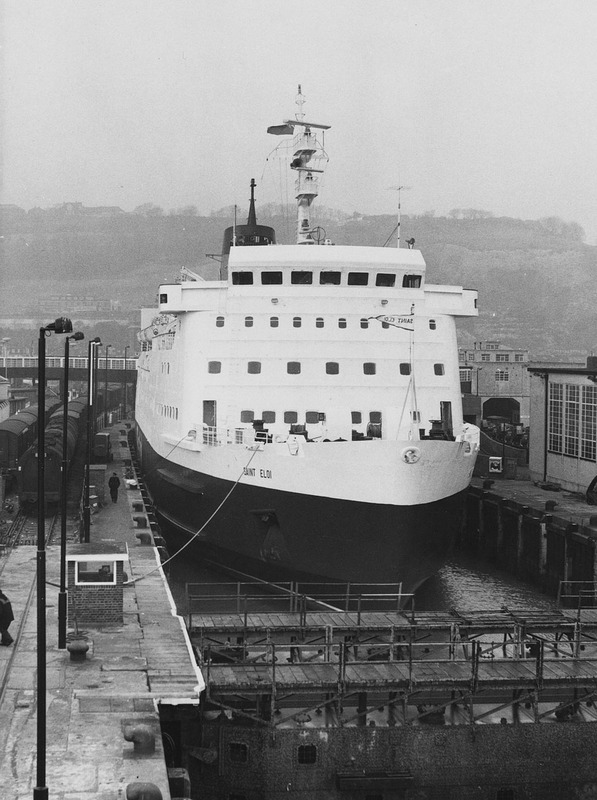 The TWICKENHAM FERRY was launched at Swan Hunter shipyard, Wallsend. 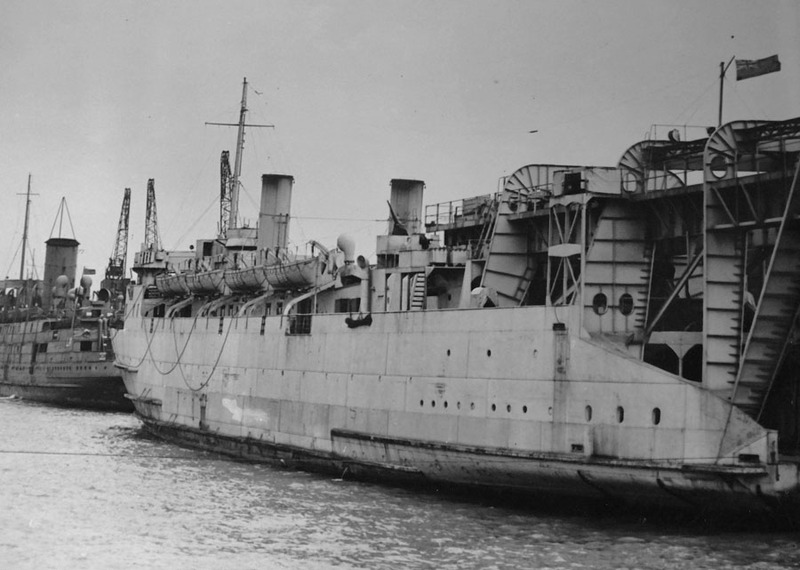 The HAMPTON FERRY was launched at Swan Hunters yard by Lady Abell, wife of SR’s consultant Sir Wescott Abell, Professor of Naval Architecture, Newcastle University. The SHEPPERTON FERRY was launched. 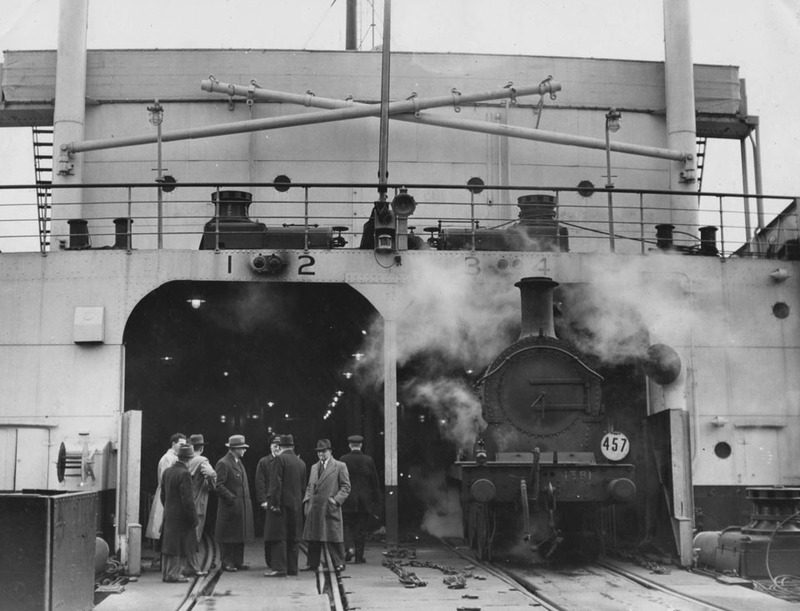 Following a conference between the Southern Railway, Nord Railway and Compagnie Internationale des Wagons-Lits (CIWL) it was decided to postpone the start of the Night Ferry service. 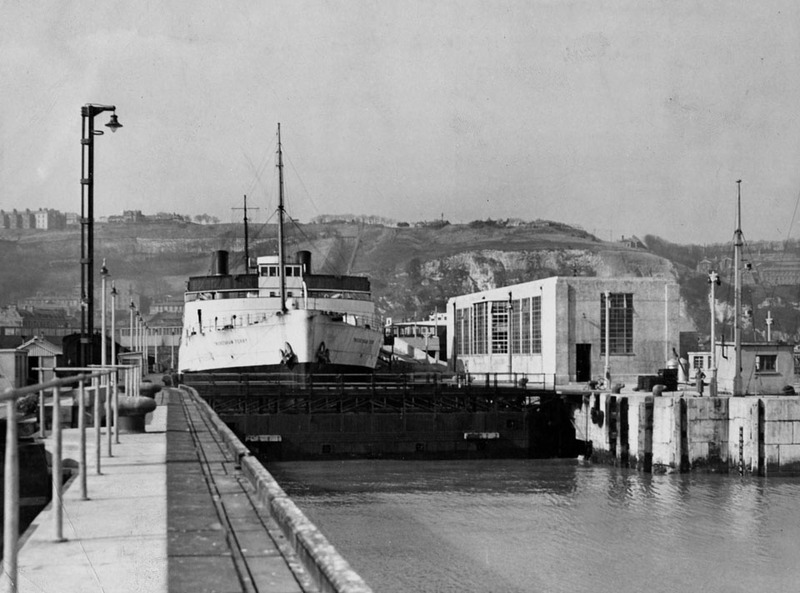 This was initially planned for the 10th August 1935 but was delayed until October 1936 due to a delay in completing the Dover train ferry dock. 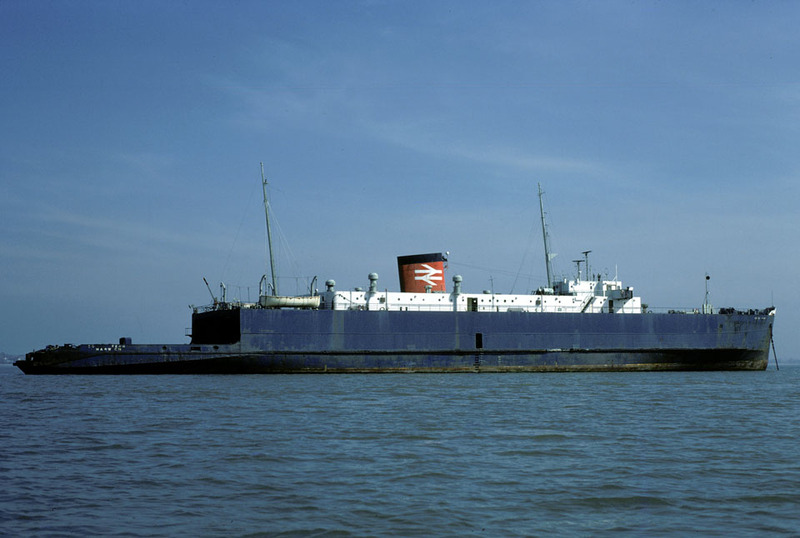 The SHEPPERTON FERRY was delivered to Southern Railways and joined the TWICKENHAM FERRY and HAMPTON FERRY laid up at Southampton New Docks and later at Dover. First of twelve Type F sleeping cars delivered to Compagnie Internationale des Wagons-Lits by Ateliers de Construction du Nord de la France; cars stored at Aulnoye until needed. The TWICKENHAM FERRY was sold to ALA and re-registered in Dunkerque (instead of London), with a French crew and registered under the French flag, however her name remained unchanged. 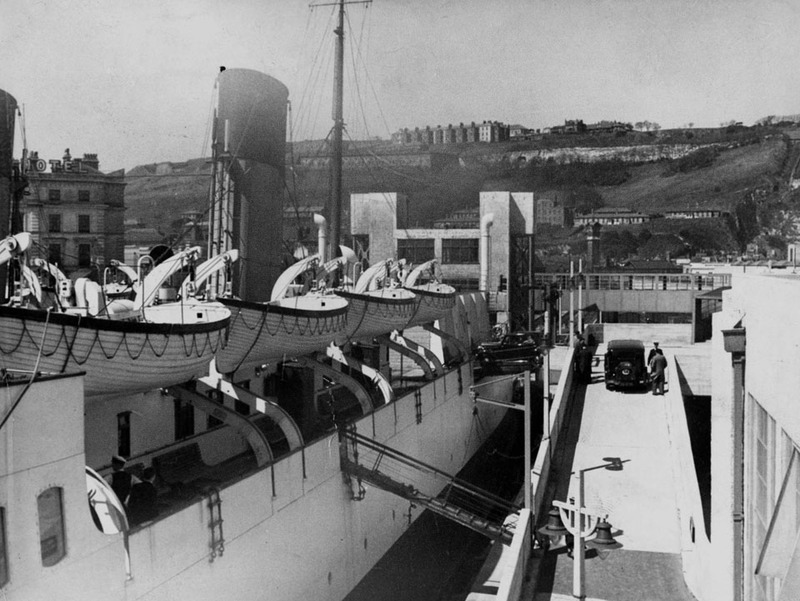 The ALA Dunkerque-Folkestone service ended. Freight service starts via Dover-Dunkerque train ferry. The London North Eastern Railway (LNER) closes the Harwich-Calais service. Inaugural party travels from Paris to London in two trains of six sleeping cars. First-ever through passenger train from Britain to mainland Europe for the general public. This service also carried the London-Paris mail. Service commenced both ways, operating nightly (except Christmas Day). 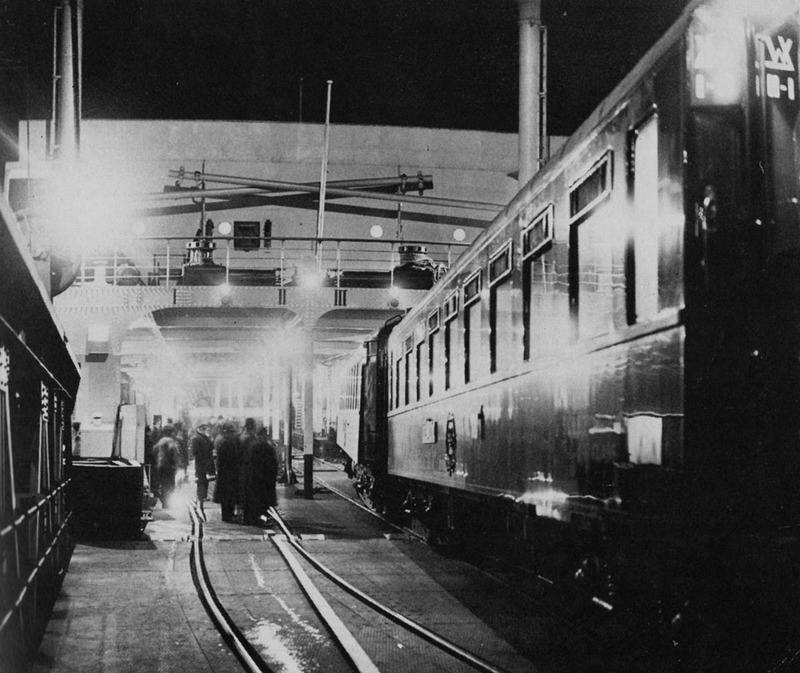 Non-supplement Pullman car added to Southern Railway trains to provide supper and breakfast for Night Ferry passengers. 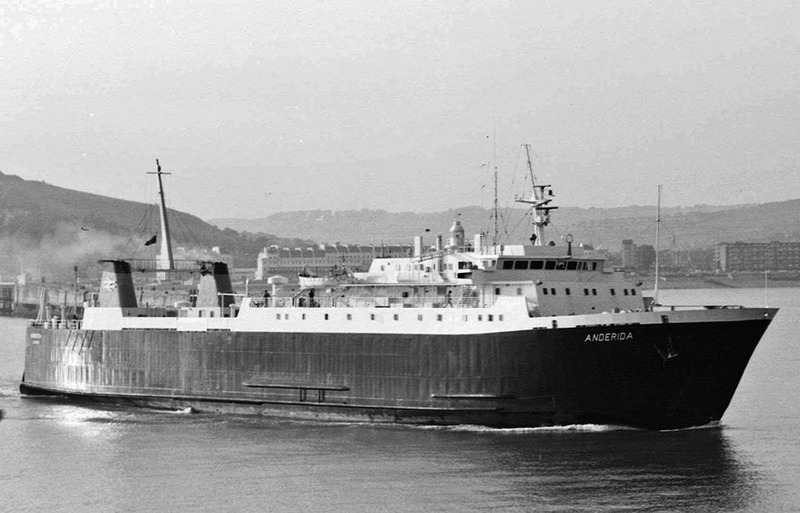 The ALA ships FLAMAND and ALSACIEN were sold for scrap. The PICARD was sold to Greece. 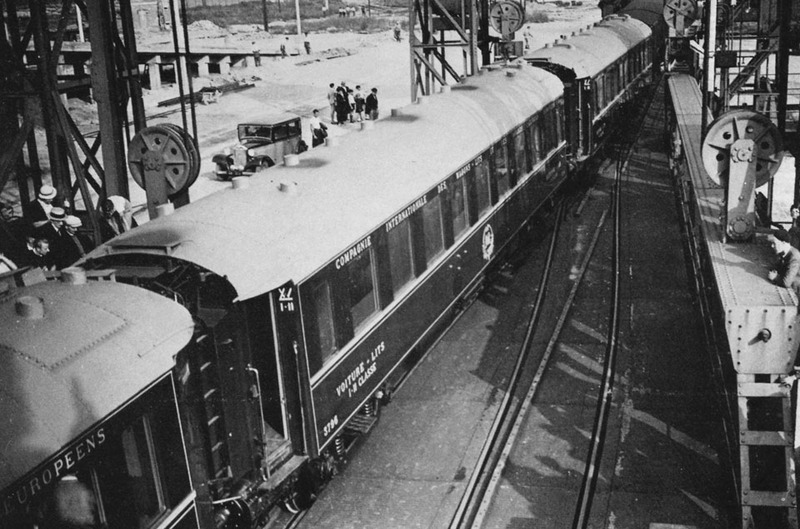 33,000 sleeping car passengers carried since October 1936, plus 30,000 “seats” passengers. Compagnie Internationale des Wagons-Lits (CIWL) ordered six more Type F cars from its car-building subsidiary Compagnie Générale de Construction, St. Denis, Paris. The Nord Railway was nationalised to become the Nord Region of the Société nationale des chemins de fer français (SNCF). Six new Night Ferry sleeping cars were delivered to Compagnie Internationale des Wagons-Lits (CIWL) for completion in their own workshops. With the outbreak of World War II the HAMPTON FERRY and SHEPPERTON FERRY were mobilised for mine laying and transport duties. The War in Europe ended. The search now started for about 800 missing Wagons-Lits cars including Night Ferry sleepers. 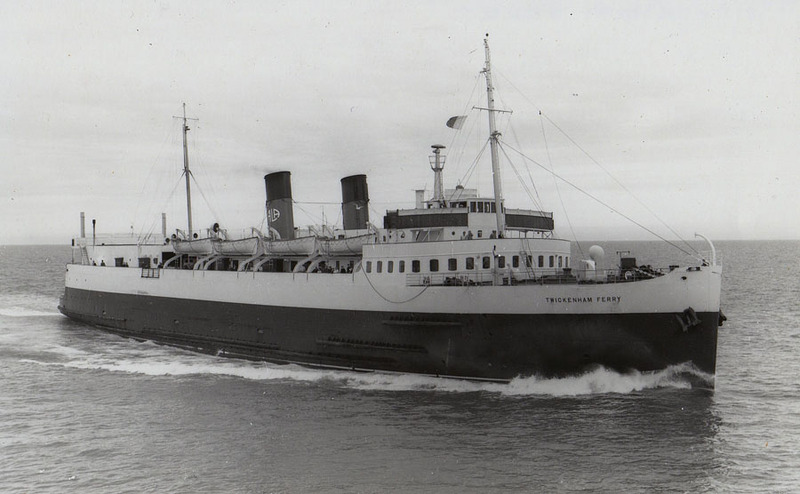 The SHEPPERTON FERRY and HAMPTON FERRY were used as troop transports between Cherbourg and Southampton. 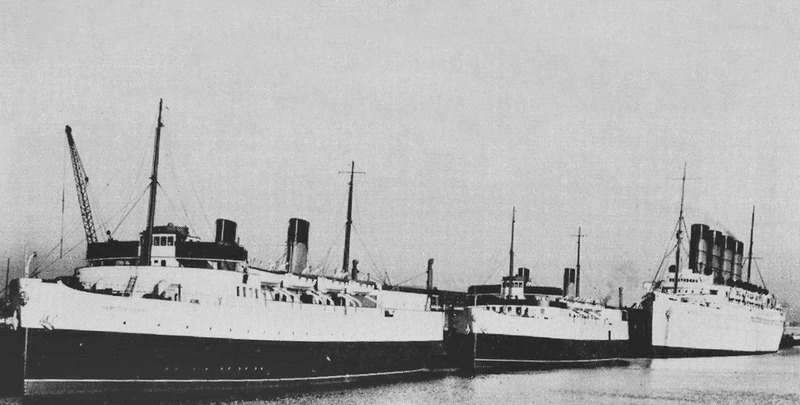 The Night Ferry could not initially restart because the port of Dunkerque (except it’s linkspan berth) was heavily damaged and the British Army also required the train ferries for the British Army of the Rhine (BAOR) freight and mail via Dover-Calais (Nottingham-Herford military store train). The TWICKENHAM FERRY was handed back to ALA, after this all three train ferries were converted from coal to oil-burning at Glasgow. The Night Ferry restarts from Paris; both ways from December 15th. The Southern Railway was nationalised (but not the Pullman Car Company). The Southern Region of British Railways took over from the Southern Railway. 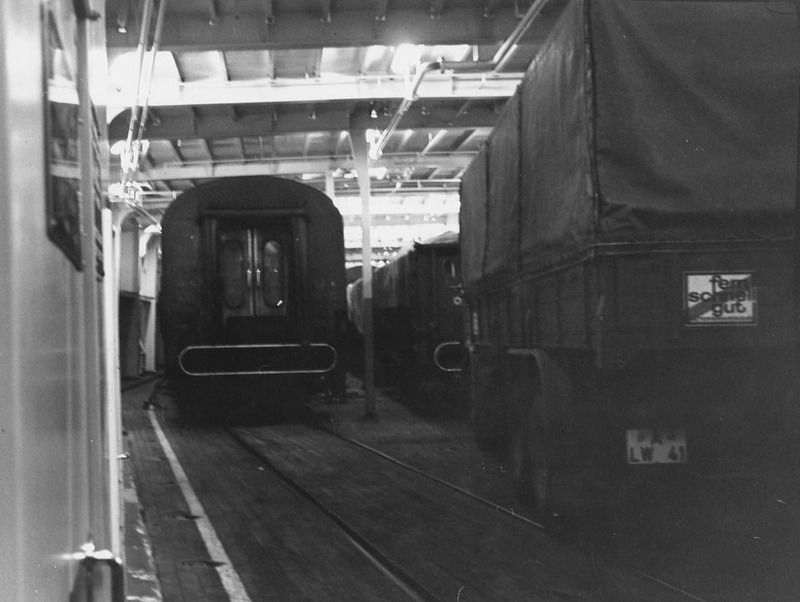 Pullman now staffed the BR restaurant car on the Night Ferry. WL car Dunkerque-Paris and v.v. added early 1949. Wagons-Lits orders seven new sleeping cars from Cie. Générale de Construction, St. Denis. The new SNCF ship SAINT GERMAIN arrived in Dunkerque from Helsingør (Denmark). 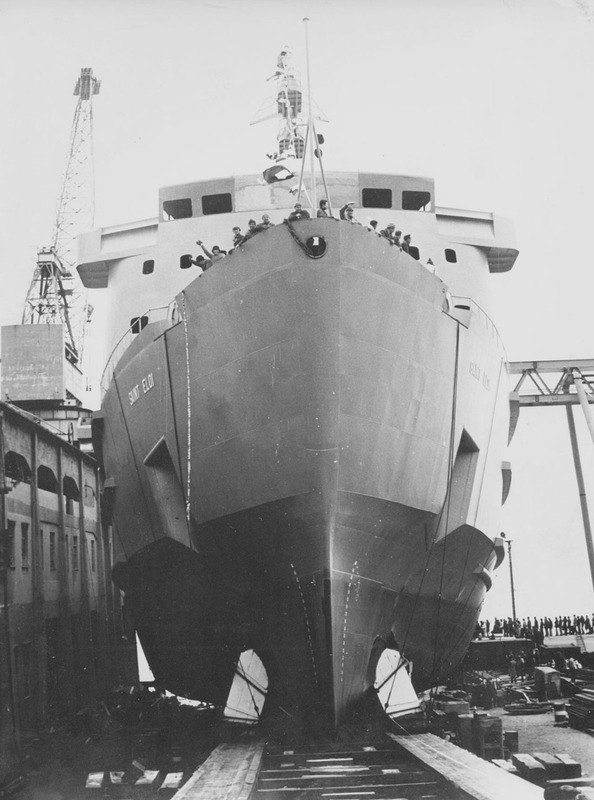 She entered service on the 28th/29th July 1951. 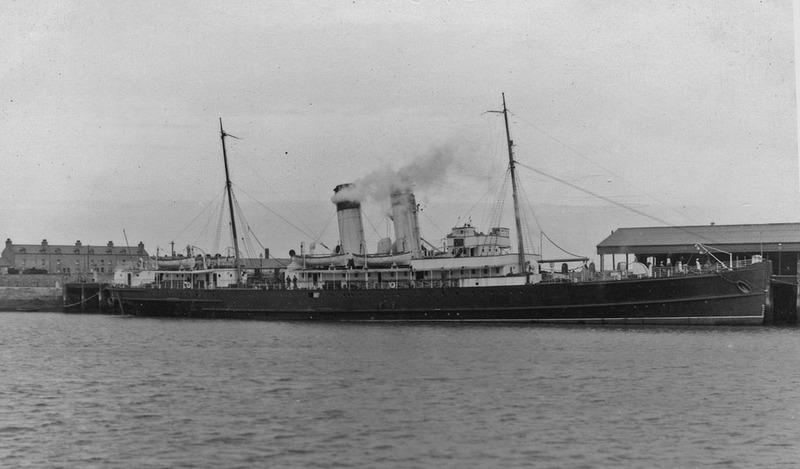 The HAMPTON FERRY became the relief ship, occasionally used on the Stranraer to Larne route. Seven new Wagons-Lits Type F sleeping cars entered service, total now 20. Normally six each way per night. BR pressed for a London to Brussels sleeper, without success. Severe winter; Dunkerque harbour frozen, delaying the Night Ferry. 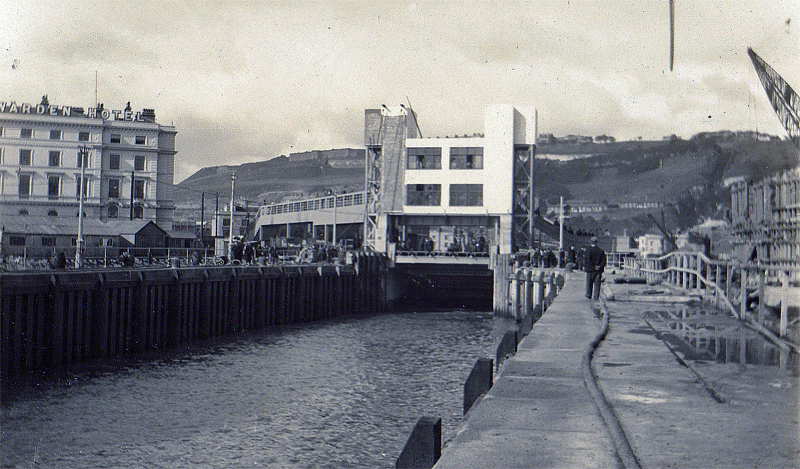 The Dover Marine station was closed until March 1st 1959 for layout alterations. 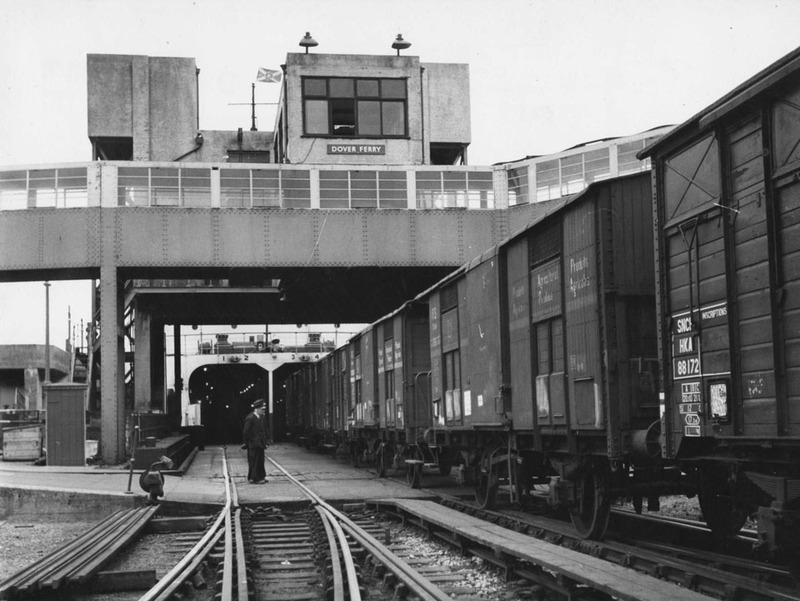 The Engine spurs were removed and the platforms were extended landwards to take longer trains, requiring construction of new section of footbridge to the ferry berth. 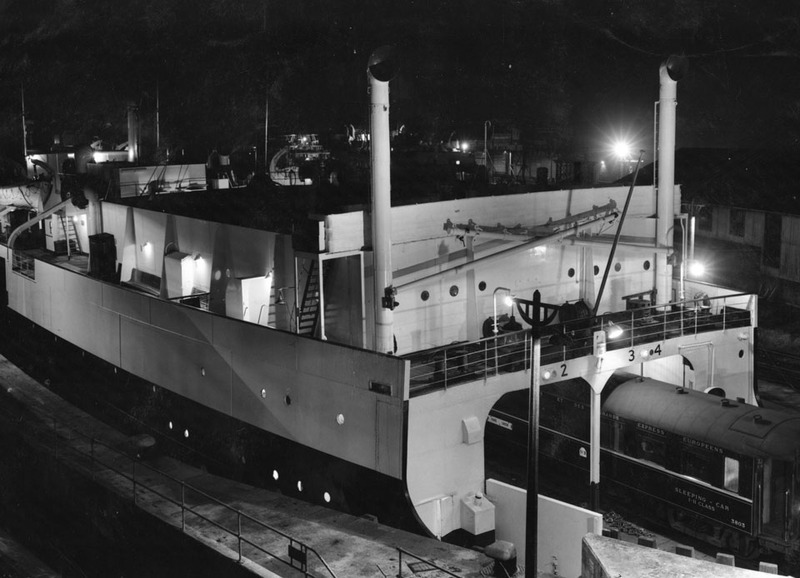 Dover – London Night Ferry was steam-hauled due to severe weather. This was the last ever use of steam on the service in Britain. Class 71 locomotive E5021 on up Night Ferry crashed into the buffers at London Victoria. 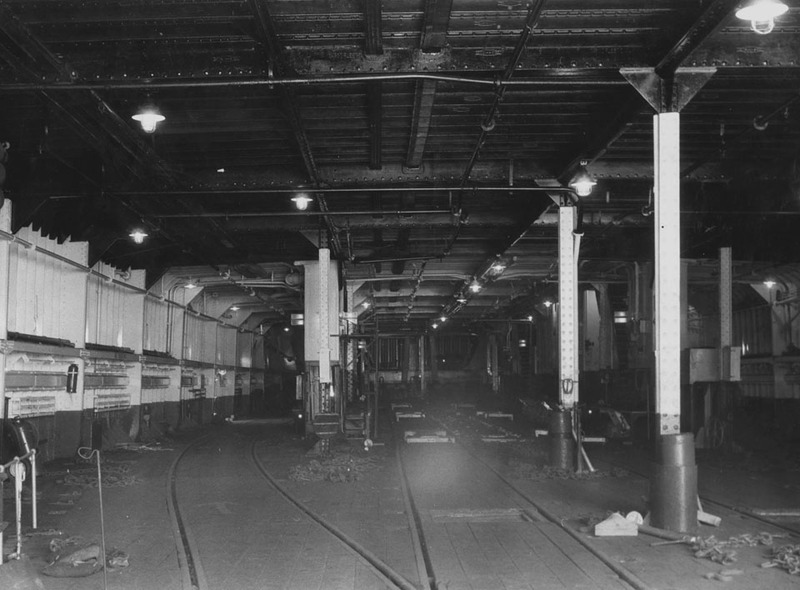 This was the only reported accident to the Night Ferry train during 44 years of operation. The TWICKENHAM FERRY was entering Dunkerque harbour towed by tug ROBUSTE with tug BELIER attached to the stern; for some unknown reason the BELIER sank in less than a minute. Five of her crew were drowned with four saved by the ALA launch CANODALA. Ernest Marples, Minister of Transport, gave the go-ahead to Channel Tunnel. BR starts Harwich- Dunkerque freight train ferry with the ESSEX FERRY and the NORFOLK FERRY. 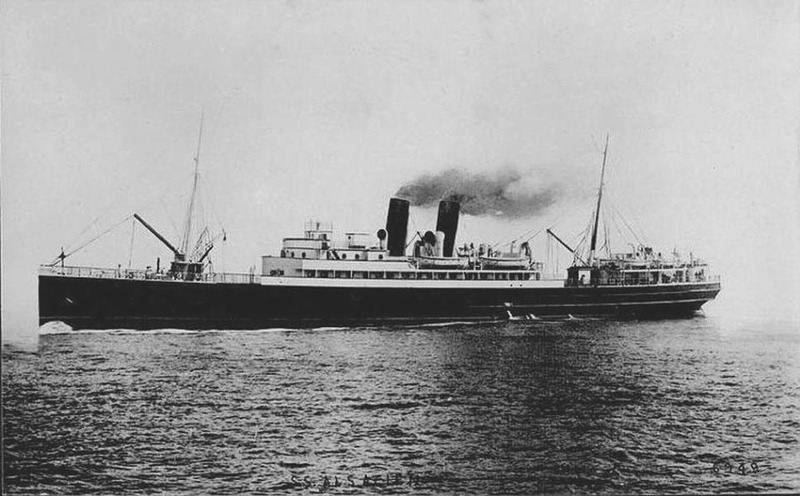 Owing to a French seamen’s strike the Night Ferry sleepers were stranded in London for a week and then returned empty to Paris and Brussels by a special sailing from Dover to Zeebrugge. 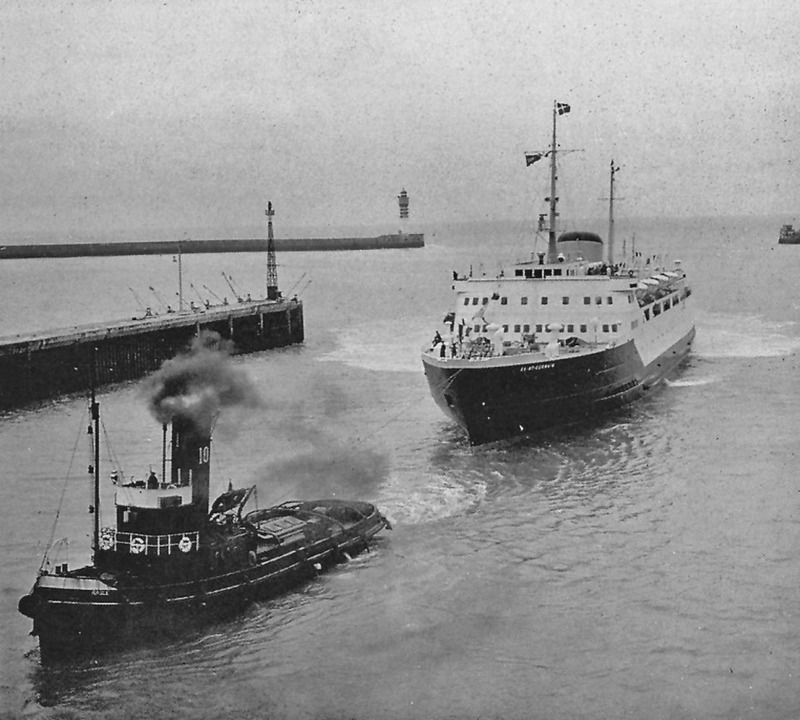 The HAMPTON FERRY was taken off the Night Ferry service but continued as rail freight ferry between Dover and Dunkerque until the autumn. She then proceeded to Holyhead to be laid up pending disposal. 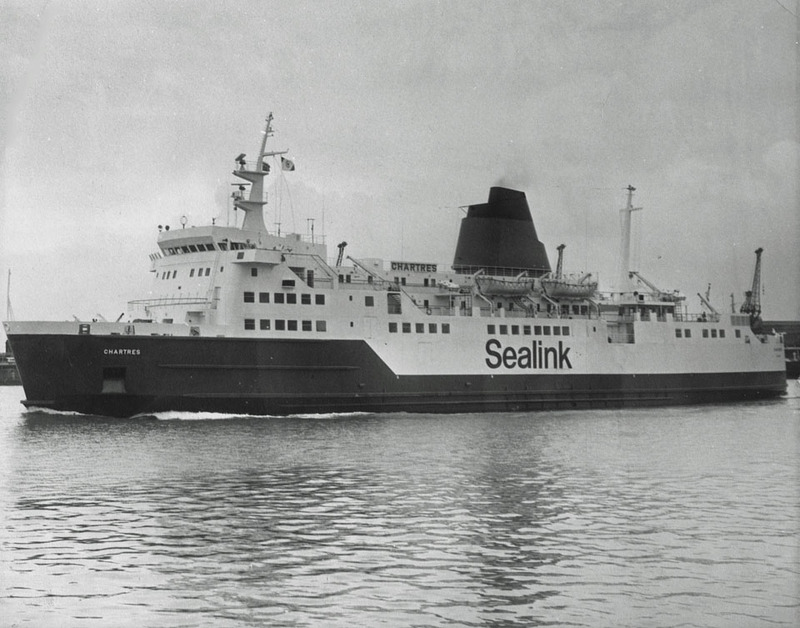 The new Sealink multi-purpose vessel VORTIGERN entered service between Dover and Boulogne as a car ferry. First sailing of the VORTIGERN with Night Ferry sleeping cars. ALA ordered a new multi-purpose ferry to be called the SAINT ELOI from Cantieri Navali di Pietra Ligure, Genoa. Italy for delivery in December 1971. Last sailing of the SHEPPERTON FERRY, she is sold to a shipbreaker in Spain, replaced by ANDERIDA, never used for Night Ferry services. 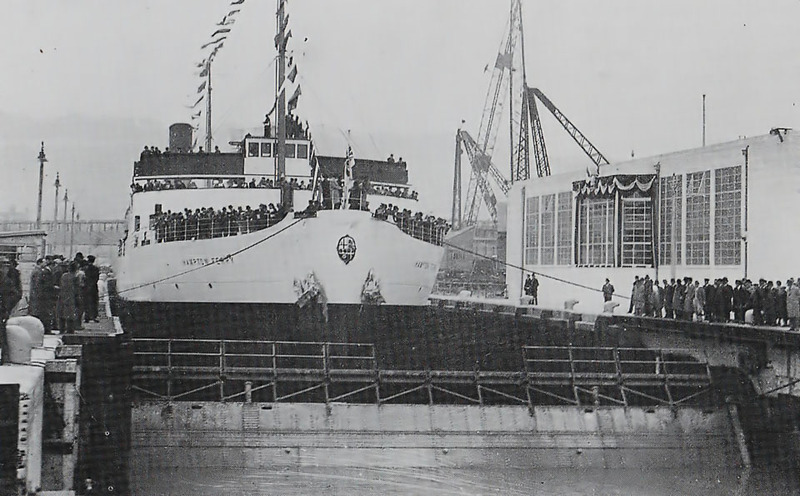 The SAINT ELOI was launched in Genoa by Madame Margot Noblemaire, wife of René Margot Noblemaire, President of ALA and Director of the Compagnie Internationale des Wagons-Lits (CIWL) (Director-General,1933 – 1958). Work re-commenced on the Channel Tunnel in both the United Kingdom and France. The new SNCF multi-purpose ship CHARTRES arrived at Dunkerque; takes first freight sailing Dunkerque – Dover on the 25th March, then occasionally she took Night Ferry sailings with sleeping cars. SNCF suspended services until May 18th to enable them to repair the Dunkerque train ferry linkspan. 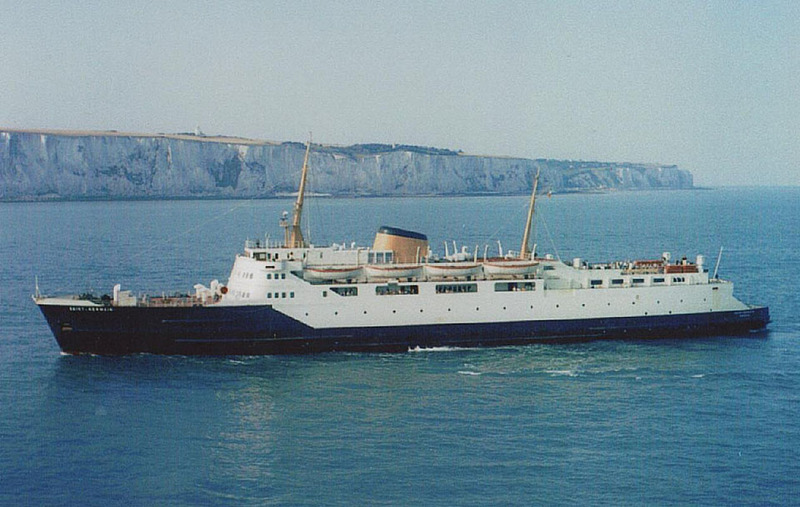 Replacement sailings were routed from Calais to Dover. Upon arrival by train passengers changed to first class couchettes. Last sailing of the TWICKENHAM FERRY on May 4th after 22,210 crossings. On the 20th January 1975, to the dismay of their French partners, the now-governing Labour Party in Britain cancelled the Channel Tunnel project due to the uncertainty about EEC membership, doubling cost estimates and the general economic crisis at the time. By this time the British tunnel boring machine was ready and the Ministry of Transport was able to do a 300 m (980 ft) experimental drive. The cancellation costs were estimated to be in the region of £17 million. The new ALA ship SAINT ELOI finally entered service, some four years late. She replaced the CHARTRES, except for her occasional relief duties until July 1976. Dunkerque Ouest (West) opens for freight train ferry traffic. Night Ferry transferred to Dunkerque Ouest (West). The SAINT GERMAIN was involved in a fatal collision in dense fog off the Port of Dunkerque with the Liberian flagged bulk carrier ARTADI . Unfortunately two people were killed and four were injured. Sir Peter Parker, BR Chairman, announced the end of the Night Ferry sleepers in an interview in Paris. Last departure of Night Ferry from London, Paris and Brussels. SNCF announced the ending of Dover to Dunkerque passenger sailings, thereafter the route would only convey rail freight. 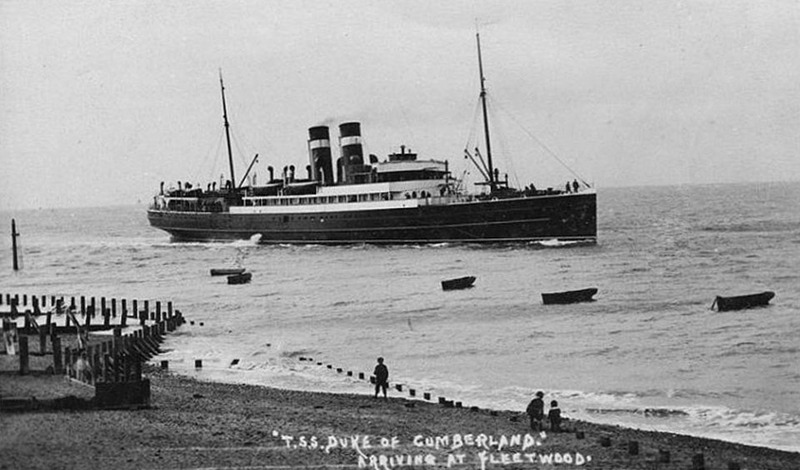 Passengers were rerouted to go via Newhaven – Dieppe. All information is believed to be correct and no responsibility is accepted for any errors or omissions found. All items included in this article are subject to © copyright. We would like to take this opportunity of thanking: Ted Ingham, Ken Larwood and Brian Fisher for their assistance in compiling this feature. Hello, i love those old stories but i told before, the photo’s are from a good quality especially the last one that’s in Dunkirk I presume taken from the air, I like this one because here you can see how the harbor is developed to a harbor how it’s like today. Keep up the good work I will say and yes I have something with the past, its because of the expanse of transportation like trucks and cars. We can’t stop the renewing from harbors etc. 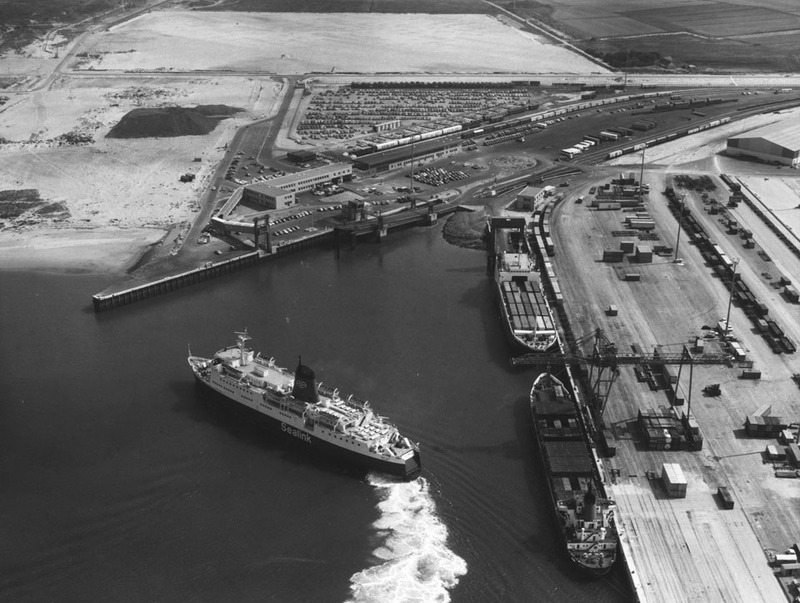 But it’s nice to see how some harbors such as Dover and Dunkirk has developed in time. 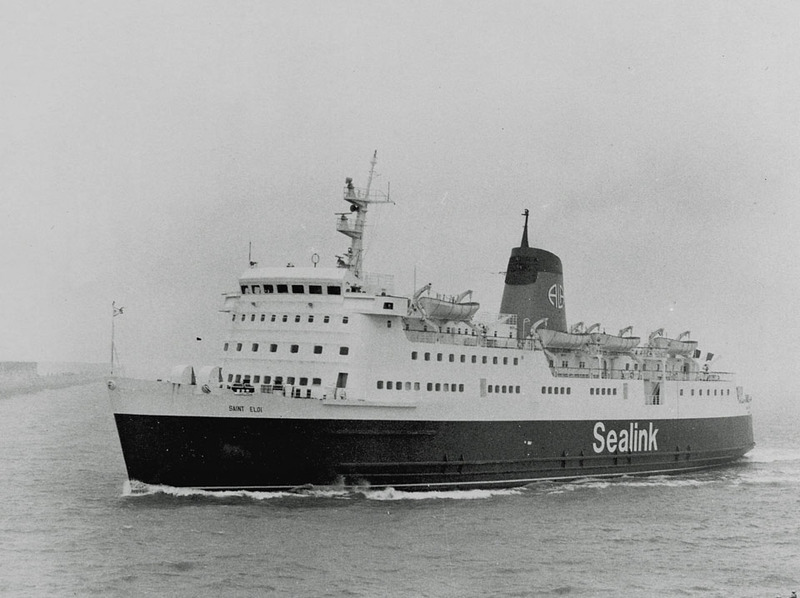 I have such a personal history with the Dover/Dunkerque ferry. My mother and father split up in 1971 after she met, and fell in love with, a chef on the St Germain and went to live with him in Dunkerque. I used that ferry so many times until its demise in 1980. Thank you for taking the time to comment on our articles. I am always interested in peoples own incites into the ferry industry and why they have a interest in a particular vessel/route. Every story is different and personal to the person recalling them. Thank you for developing these nostalgic webpages, full of interesting notes. I have fond teenager memories of the French-operated Saint Germain and Twickenham ferries, from making several [free] return crossings on them between 1969-1974, all courtesy of their captains and my father, a TH pilot. 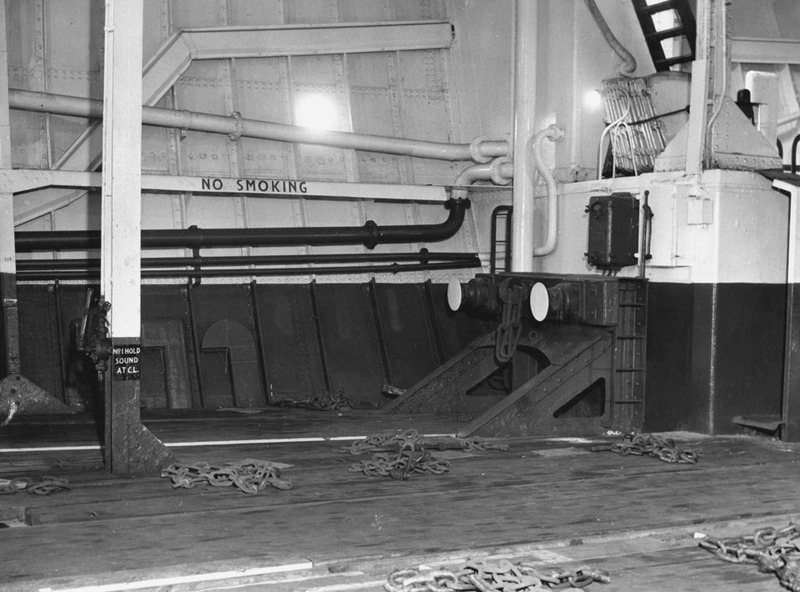 Unlike the car and truck ferries, train ferry pilotage was compulsory for the Dunkerque-Dover leg owing to the nuances of their turn-around and stern-entry squeeze over the gate sill into the narrow train dock (the post-war arrangement at Dunkerque was more roomy). Compared to the British operated ferries, Saint Germain’s stylish looks, spacious bridge and a la carte restaurant were impressive. This plus the romance of the blue SNCF sleeper cars, all lined up in the bowels of the train deck, left hints in my teenage imagination as to what Atlantic-crossing atmospheres one might experience on a fabulous French liner! 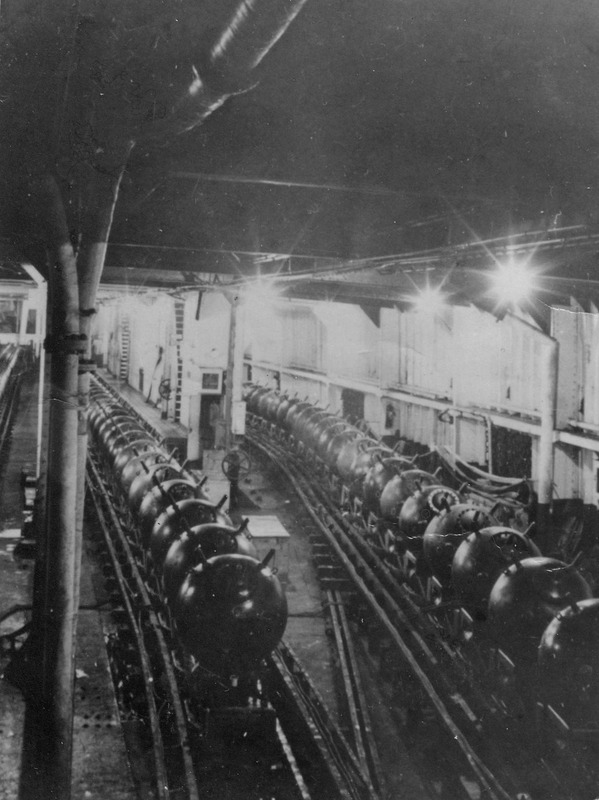 While the restaurant fare on ‘le Twickenham’ was no less delicious, its elderly wheelhouse was tiny and stuffed with radio and radar sets that seemed to jostle for space between the rich polished brass and wood chart tables, binnacles, telegraphs, repeaters and voice tubes of the pre-war era. Centered between the long bridge wings that offered minimal protection from the wintry elements, its arrangement and contents always turned my thoughts to the era when icebergs earned their reputation! 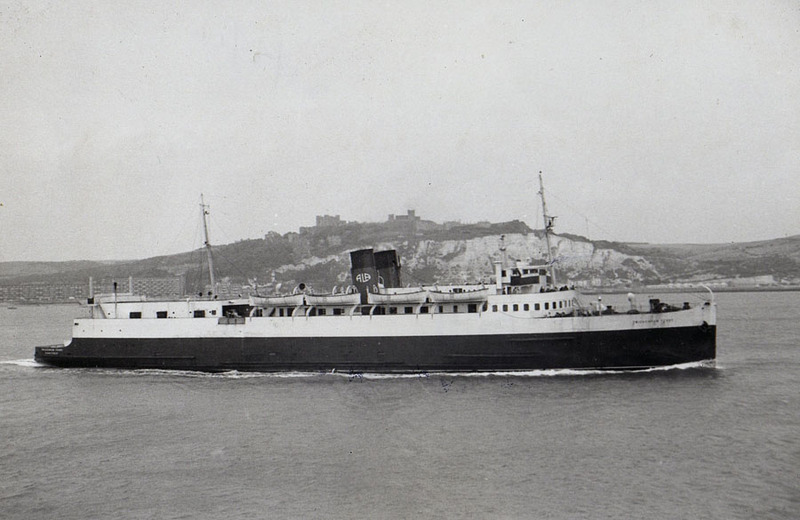 I believe the unique pilotage needs at the Dover end continued until 1980, but can’t remember if the insurers of the BR-operated train ferries allowed their Masters to gain the exemption certificate or not. I was a trainee staff member of the old Thomas Cook & Son Ltd undergoing a staff training course at the old HQ in Berkeley Street W.1 in 1957. 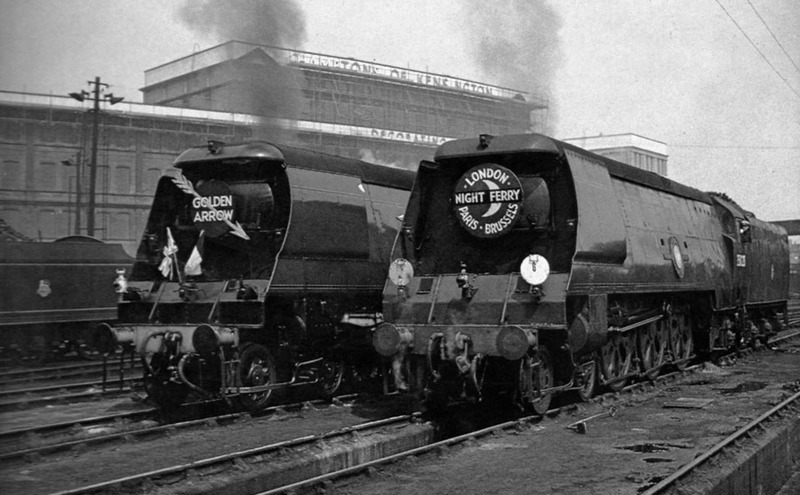 Recall being taken to Victoria Station and going onboard the Wagon-Lits Sleeping Cars which had arrived overnight from Paris, much polished mahogany and brass work, what atmosphere. Sadly was never able to actually travel on the “Night Ferry”.